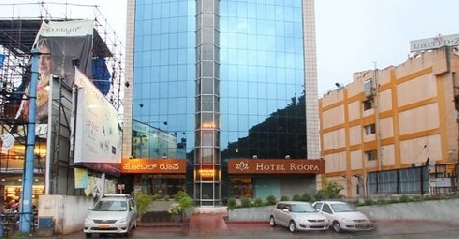 Hotel Roopa is a contemporary hotel that is beyond any comparison situated in the heart of Mysore city. 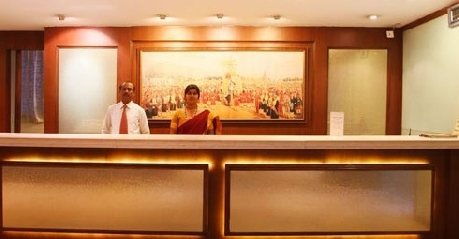 As soon as you step into the hotel, you will experience the warmth of the Mysorean hospitality. The Mysore Palace is just a few minutes’ walk from the hotel and the Mysore Railway Station can be reached by driving in a few minutes. It is a fully integrated business hotel that offers world class business and meeting facilities. Ideal set up is available to conduct group discussions, team meetings, brain storming sessions and more. The banquet hall can accommodate up to 200 people with amazing facilities. The hotel offers highest level of comfort and hospitality, making it oneof the most preferred choices for the domestic as well as international travelers. Other added advantages are the availability of a gift shop from where you can buy souvenirs at reasonable prices and the travel desk that will assist you in all your travelling needs. The deluxe rooms along with best décor offer amenities like comfortable double bed, attached bathroom with running hot and cold water supply, telephone with direct dial facility, housekeeping service, tea/coffee maker, round the clock room service, etc. These rooms can accommodate two people. 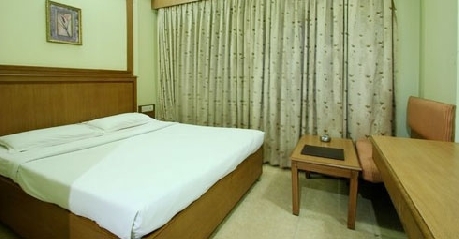 The executive rooms have been designed specifically to cater to the business travellers. Each room is equipped with modern and contemporary fittings to provide an unmatched staying experience in the city. These rooms come with attached bathroom with essential toiletries, comfortable beds, Satellite television, direct dial telephone with STD and ISD, tea/coffee maker, mini bar, 24 hour room service, housekeeping facility and more. 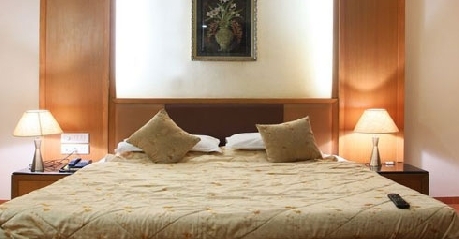 Two persons can easily be accommodated in these rooms. The air-conditioned, spacious luxury rooms come with breathtaking view of the city. They are tastefully designed with modern fittings and traditional furniture to make your stay in the city completely luxurious. They offer an exclusive stay with best amenities like Satellite TV, in room temperature control, housekeeping service, direct dial telephone facility, Wi-Fi connectivity, 24 hour room service, attached bathroom with select toiletries etc. These rooms can accommodate two persons. The air-conditioned suite is one of its kind luxurious accommodations at the hotel. The suite is tastefully decorated with good furniture and fine furnishings. They offer best in class amenities like comfortable double bed, en-suite bathroom with select toiletries, direct dial telephone, uninterrupted Wi-Fi, housekeeping service, tea/coffee maker, Mini Bar, in room temperature control, round the clock room service etc. 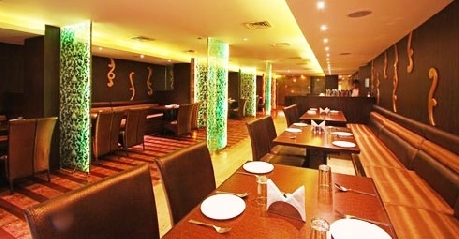 Spicez Fusion offers a dynamic concept in dining and is located at the Lobby level. The soothing lights and the ambience of the hotel relax and rejuvenate the guests. The connoisseur of food gets delighted with the choice of menu that is available on the platter. The plethora of options includes Mexican Tacos, Italian Gelato, Thai Noodles, Greek Mousaka, Spanish Pasta and more. These choicest delicacies will tempt your appetite and will not stop tickling your taste buds. The softly lit Mini Bar stands attached to the Spicez Fusion restaurant and provide a romantic ambience. It offers an extensive range of cocktails, mocktails, mojitos, martinis, frozen Daiquiris and more. The changing LED lights amass you to entirely a new world. At Infinit Lounge Bar and Fine Dining, dine, drink and celebrate is the mantra. Set amidst greenery, this restaurant provides picture perfect view of the Chamundi Hills, Mysore Palace and St Philemono’s Church. Designed with an eye towards perfection, this restaurant offers all day fine dining to the guests. It has a well-stocked bar with a fine collection of wines to satisfy the needs of all guests.